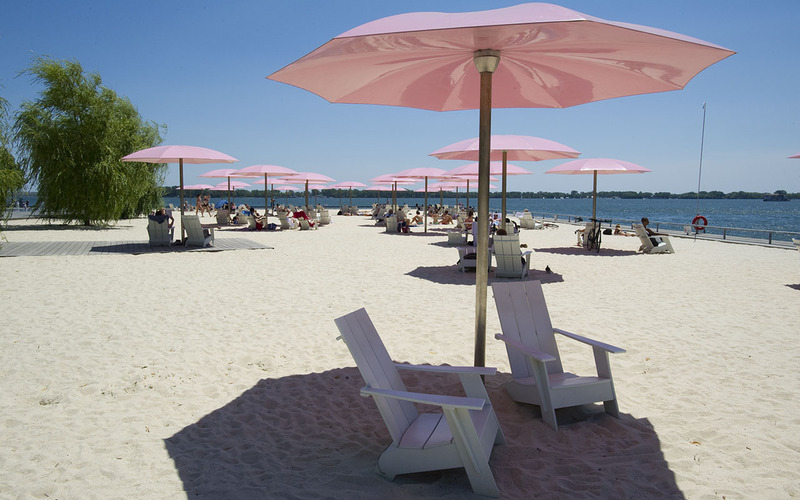 Sugar Beach draws upon the industrial heritage of the area and its relationship to the neighbouring Redpath Sugar Refinery Museum to create a whimsical urban beach at the water's edge. The beach allows visitors to while away the afternoon as they read, play in the sand or watch boats on the lake. A dynamic water feature embedded in a granite maple leaf beside the beach makes cooling off fun for adults and children. The park's plaza offers a dynamic space for public events. A large candy-striped granite rock outcropping and three grass mounds give the public unique vantage points for larger events and the space between the mounds result in a natural performance space for smaller events.